My boy has had this red discoloration on one of his front elbows for a year now. 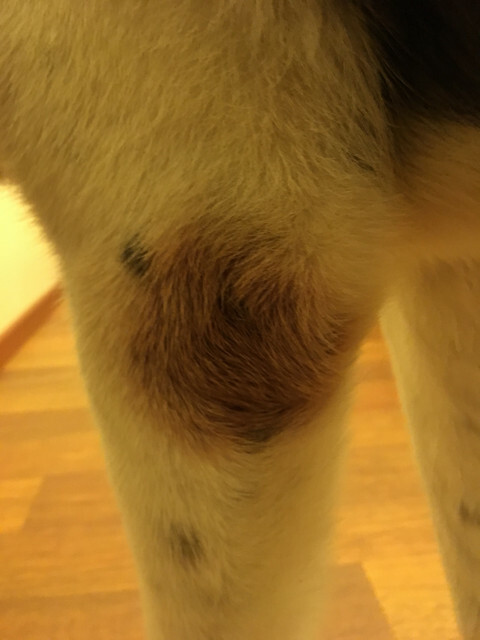 The vet said it is just a calus from laying down and getting up on hard surfaces, however it is not like a calus in terms of it being soft. The fur doesn't fall either, it is just discolored and only on one elbow. The skin underneath the fur is slightly red as well. Has anyone else have similar experiences with their Akitas? Yup I've had the same things with mine. I put a mat in her crate and bought some dog beds and so now she's not always laying on hard surfaces. The discoloration and calluses went away. It's still a little bit red, but not nearly as bad as they were before. My Akitas didn't look as big as what your pups look like in the picture. But the color and shape match perfectly. @treysmith417 thanks for the response bud. I've done a lot of the same stuff. He has a doggie bed in every room but he just prefers the hardwood floor. He'll spend some time in the beds too but I guess not enough time. Not with Akita, but my female NI suffers with this too and it occasionally comes up on the boys as well. It started off as a discolouration of fur and eventually turned into a hard callus. For her it's because she likes to lie out on the tiles in the kitchen whereas the others prefer to be on the sofa or their bed. You can get creams that will help but the main thing is to try and stop them lying on hard flooring...which is difficult when it's hot. You can put bag balm on it if bothers you. Our oldest gets this.